Agencies hold some authority to rearrange their priorities and structure, according to individuals with experience in reorganizing government, but several factors -- both internal and external -- could hold up the process. 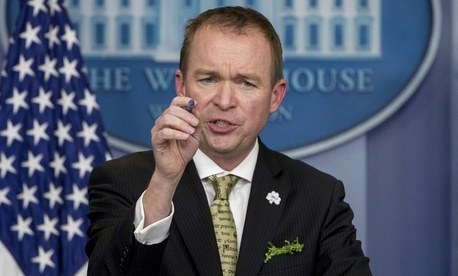 In guidance issued last week, Office of Management and Budget Director Mick Mulvaney told all federal agencies to come up with plans they could implement themselves, as well as larger reform efforts that would require congressional approval. Even where agencies can unilaterally institute change, they could run into roadblocks. The White House has insisted it will not take a top-down approach, instead allowing agencies to come up with their own ideas to streamline their operations. It should still consider providing additional details on exactly what constitutes a change, said Ed DeSeve, who served as OMB’s deputy director for management while the Clinton administration was attempting to “reinvent government.” The full extent of what agencies “can do with their own authority is unclear,” DeSeve noted, but said there are some specific examples of steps they can take without Congress. If certain agencies wanted to eliminate their regional offices, they would be within their rights to do so. They can abolish organizational units if Congress did not specifically establish them. The Environmental Protection Agency, for example, has already eliminated its climate adaptation headquarters office. Dave Mader, OMB controller in the Obama administration and a longtime career federal executive at the Internal Revenue Service, said agencies can also streamline their operations without Congress by adopting shared services for back office functions. While Mulvaney said when unveiling the guidance last week the initiative had never been attempted, previous administrations have led efforts to reorganize the executive branch, reduce waste and eliminate redundancies. Those projects often relied on the formation of a third-party group to oversee the process and make recommendations, while Trump’s campaign will be driven internally by the agencies themselves. DeSeve described the Trump administration’s efforts to restructure agencies based on functionality as “unprecedented.” Such a strategy, however, is not without potential pitfalls. “The natural disposition of any agency will be to protect programs and activities they currently operate,” said Chris Edwards, director of tax policy studies at the conservative think tank Cato Institute and editor of DownsizingGovernment.org, who generally supports Trump’s plan. He explained agencies may drag their feet by proposing “small things” such as reducing contract spending while ignoring the true intent of OMB’s guidance. “I find it hard to believe people who work on certain programs will say ‘this program doesn’t work, we should get rid of it,' ” he said. Edwards suggested another approach agencies can take unilaterally, proposing a mandatory cost-benefit analysis system for all federal programs similar to that which takes place for all new major regulations. Agencies do not routinely evaluate whether their programs are actually working, he said. Edwards warned agency reforms would never get off the ground if every proposal is met with a member of Congress who “jumps in front of the reform train and says 'no way, not in my district.' ” A comprehensive plan to restructure and reduce the executive branch can only work if “everyone takes a bit of the pain for the good of the reform,” he said. DeSeve suggested the White House maintain frequent communications with leaders on both sides of the aisle to keep them apprised of plans and win their support for certain proposals. “Even if you do things that are seemingly innocuous, Congress will have serious concerns about what you did,” he said. The campaign with Congress will be waged on two fronts; first, to prevent lawmakers from bulldozing the more minor reform efforts agencies theoretically can impose on their own, and second to win votes on proposals that will require them. “Agencies will begin implementing some reforms immediately while others will require congressional action,” Mulvaney wrote in the guidance. That process will likely prove even more difficult to navigate than the initial changes the Trump administration will attempt to complete on its own. Even prominent Trump allies have come out against some of his calls for cuts and reorganization; Senate Majority Leader Mitch McConnell, R-Ky., quickly said he would not allow any cuts to the Appalachian Regional Commission, which Trump’s fiscal 2018 budget called for eliminating, and Sen. Rob Portman, R-Ohio, said he would fight back against proposed cuts to Great Lakes cleanup spending. Former Rep. Henry Waxman, D-Calif., who used to chair the House Oversight and Government Reform Committee, told Government Executive the administration will potentially have to battle with three different types of committees to implement its ideas: the relevant appropriations and authorizing panels, as well as the general oversight committees, such as the one he led. The administration could run into trouble even on issues it thinks it has control over, as members who hold the purse strings can block proposed changes from going into effect. Mader agreed, saying he has seen the benefits of executive and legislative branch collaboration on even minor issues. While agencies’ final plans for restructuring will not be officially finalized until Trump submits his fiscal 2019 budget next year, they face a more pressing June 30 deadline to submit initial proposals. Those “high-level” outlines will require agencies to lay out plans to cut their workforces -- a process they can largely pursue independently unless congressional appropriators set employment floors in the appropriations process. That will give OMB and the White House an opportunity to assess how well agencies are addressing some of the potential obstacles to Trump’s vision of unprecedented reform. “OMB can check to make sure agencies are taking this seriously and whether they think big,” Edwards said.